Why do we need the ActionADE platform? The goal of the ActionADE platform is to bridge information gaps across healthcare providers (e.g., pharmacists, emergency physicians and general practitioners), and locations (e.g., hospitals and community based pharmacies). Our goal is to integrate adverse drug event reporting and documentation into existing health care practices to increase patient safety. Current electronic systems do not effectively prevent the re-prescribing of culprit or contraindicated drugs, because care providers rarely document adverse drug events in the first place. Also, the existing systems rarely span across healthcare sectors or locations – instead, each healthcare provider has their own, separate system in place. We want to make it easier for clinicians to report adverse drug events, and then use that information to generate timely patient- and medication-specific alerts to warn and inform them about previous adverse drug events (e.g. when clinicians try to prescribe or dispense a medication that previously caused an adverse drug event). The ActionADE Platform will also help modernize British Columbia’s adverse drug events reporting infrastructure by better meeting the data needs of researchers, drug regulators, and decision-makers, and assisting health institutions in complying with new federal adverse drug event reporting requirements. The ActionADE platform is an electronic interface and database that can be accessed from within existing electronic medical record systems (EMRs) or through a web page in settings where no EMR exists. The ActionADE entry form enables structured documentation and retrieval of electronic information related to adverse drug events, using an research-based combination of drop-down form fields. 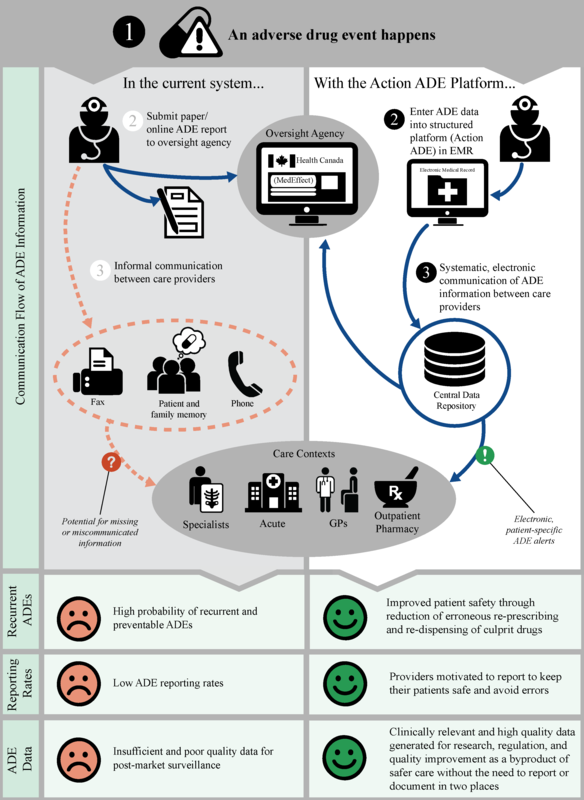 It retrieves and displays patient-specific adverse drug event information (safety alerts) when clinicians attempt to prescribe or dispense a drug likely to cause harm. Once implemented, this technology will provide real-time links between community settings (e.g., pharmacies) and hospitals to create informational continuity across transitions of care. These alerts are not the same as generic alerts currently generated by some EMRs and drug information databases. Current generic alerts warn health providers of things like known drug-drug interactions, but can often cause “alert fatigue” by popping up too often and/or providing information the care provider already knows. ActionADE alerts are different because they are generated by a single patient’s individual medical history. When the ActionADE platform alerts a physician, the alert is directly relevant to both the patient’s history and the physician’s actions. For example, an alert would only arise if the physician tried to prescribe a specific drug that previously caused an ADE in that patient. If the doctor prescribed some other drug – one that had not been linked to a previous ADE in that particular patient – then no alert would be generated. Cite this webpage as: Current Research: ActionADE Platform. (2016, February 3). Retrieved from http://actionade.org/about/current-research-action-ade-platform/.